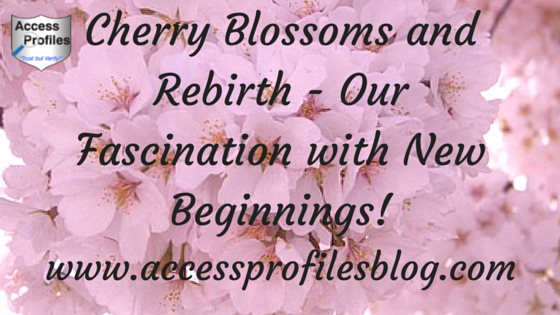 Cherry Blossoms and Rebirth - Our Fascination with New Beginnings! 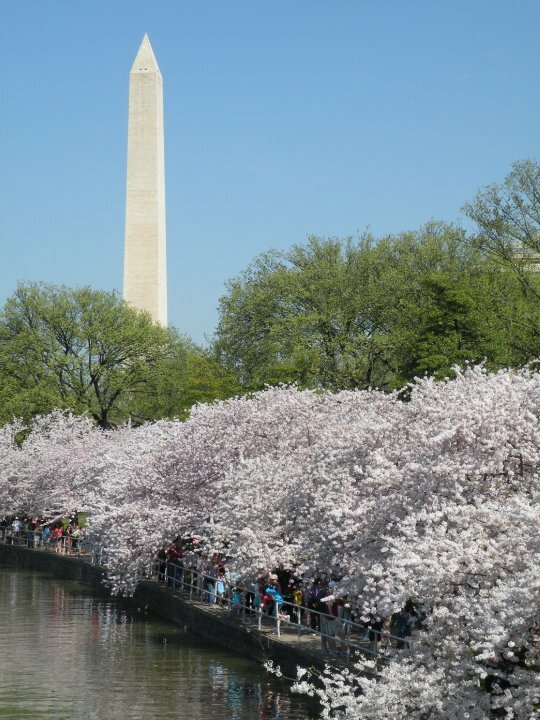 I have been fortunate to have had the opportunity to visit the Cherry Blossoms in Washington D.C on numerous occasions - and it never grows old! Each time I am awestruck by their beauty. Judging by the amount of people that make the trek, I am not alone. However, I believe that it is not just their beauty that makes the cherry blossoms such a draw. I think it is also the feeling of renewal and a “fresh start” that captivate! The truth is, being confronted by possibilities is intoxicating. There is a sense of euphoria that comes from knowing something new is possible. I propose that this feeling is addictive! In my personal life, each time I visit a new city or someone in my family is graduating or getting married, I am able to feel a resurgence of anticipation and excitement. My children are also a constant source of new beginnings. The knowledge that so much is on the horizon for them fills me with a sense of wonder. Professionally, starting my own business has been the greatest adventure. Anyone who has ever done the same knows exactly what I mean. Launching your own company is filled with “firsts”. It is an obvious and natural time to feel anticipation and excitement. That feeling is a little harder to replicate as the years go on. But I do not believe it is impossible. It think you can capture that feeling on a regular basis if you are open to it. Being willing to take a new approach to an old problem or venturing out in a new direction can help cultivate that feeling of renewal. Spring is the Perfect Time to Rekindle Your “Fresh Start”! "Tweet This"
The year is fully underway and the busyness that comes at the beginning of a new year has settled. I think this is the ideal time to look for renewed inspiration in your business and in your life. Inspiration is all around you. The welcome bloom of the trees and the emergence of the first daffodils and crocuses - each serve as a reminder that rebirth is possible. I challenge you to find your own inspiration. My yearly visit to the cherry blossoms is one of mine. What is yours? Please Share this and Spread the Word! Thanks! 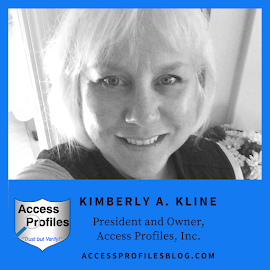 I invite you to visit my website, www.accessprofilesblog.com, for more articles of inspiration and to find out more about what I do! 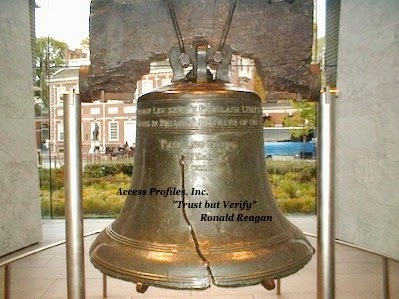 We adopted this quote from former President Ronald Reagan as our company motto. Most employers have heard discussions concerning the effectiveness and uses of background checks and due diligence investigations during the course of their business. Questions arise concerning whether running these checks are wise or even necessary. Having information on the people you employ and the companies you do business with may make the difference between a safe and profitable work environment and one that is rife with uncertainty. In my opinion, being forewarned is forearmed. 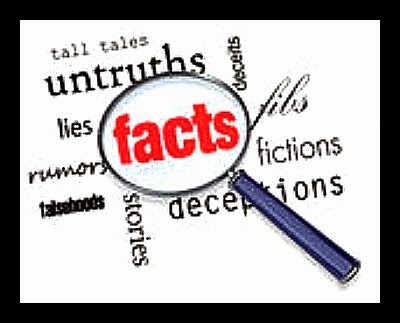 Having information at your disposal on prior criminal acts (especially violent ones) or a past history of litigation allows you to make a much more informed decision. That is not to say that the whole issue of background checks isn’t confusing. When and how you can legally use them, on whom should you run them, and what types of things you should check, are all legitimate questions. through the World of Background Checks and Emerge with the Information You Really Need! My best advice, find a company where you feel like you are partners in the process. The best choice is someone that is invested in your success and helps you make good employment decisions. The most important thing is for you to feel comfortable. It is also important that the information they provide is verified through the court system. This helps avoid errors in their reports and lessens the possibility of dispute by the subject of the background check. Find out more about choosing the right Background Check company for you here! Currently there are 2 key issues to keep in mind. First, only past criminal history that directly impacts the ability to do the open position should be considered. Second, each applicant must be given the revised “Summary of Your Rights Under the Fair Credit Reporting Act”. This outlines an applicant’s rights in disputing any adverse employment reaction based on the criminal history report. It is still possible, and recommended, that all applicants undergo a background investigation. It is simply important to be aware of the legal uses and be compliant. A good background check company will help you with this. Despite them being hired for the “short term”, both temporary workers and interns are still part of your workforce. They are privy to your company information and are, in fact, representatives of your company. It is also important to remember that these workers still come in contact with your other employees and possibly clients and customers. Therefore, as with long-term employees, safety should be of concern. information that exists at that time. Running subsequent background checks makes sense. It will uncover any new dangerous or unsafe behavior of which you should be aware. 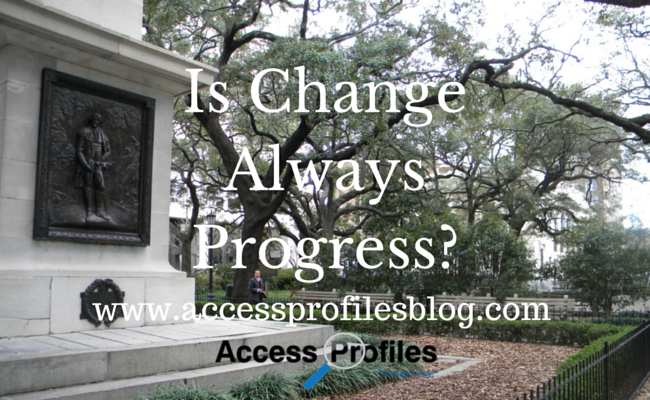 Doing an additional background check is also a great practice prior to offering a promotion. Find out more about when and how to re-screen your existing employees here! attempt to obtain passwords for current or potential employees. However, “public” information can be of great help as part of the background check process. Many times profiles on sites such as LinkedIn and Facebook can actually help clarify or “round out” the information provided in a traditional resume. 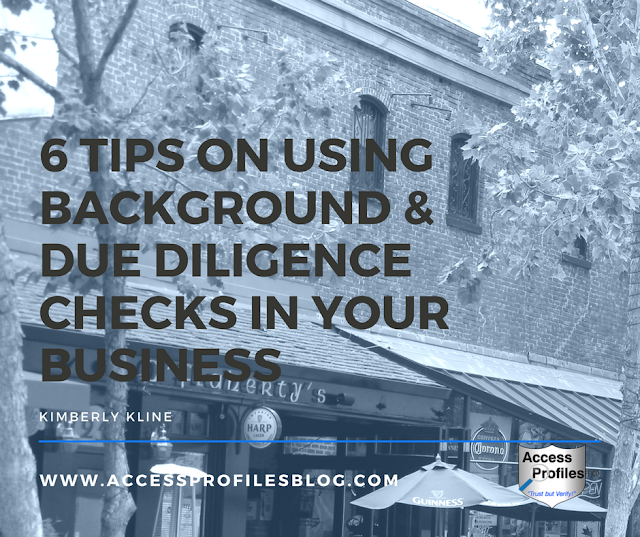 Before deciding to do business with another company, run a Due Diligence check! I recommend this include a civil record report. 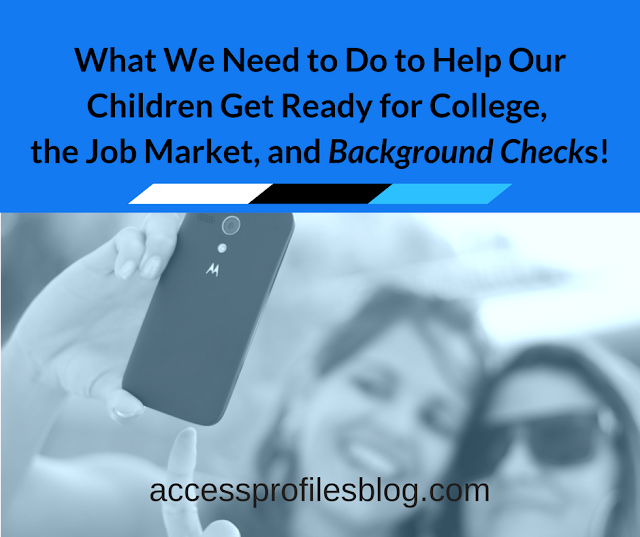 Don’t let the process of background checks scare you off. it will help you make better business choices. Subscribe to our Blog. We can Help! About Us and FAQ pages! This week’s Small Business Spotlight Shout-Out Goes to Connie Obee and her company, Exquisite Gift Baskets! Connie’s journey started when she quit her job on 9/11/2001. She was in a job that she disliked and really needed a change. Her son, Paul, was only 16 months old and, being a single mother, Connie wanted to focus on creating a life for her and her son. Connie also knew she wanted to be her own boss. Out of this desire, Exquisite Gift Baskets was born. Connie said the idea of gift baskets really did “just call out to her”! She officially started her business on November 1, 2001. The majority of that first year, Connie concentrated on learning everything she could about the gift basket business and the ins and outs of being a business owner. Connie found there was definitely a need for a good, quality, gift basket business in her area. She decided to focus on what she calls the “love” in creating her gift baskets. Connie only builds her baskets with products she would personally want and her clients have even dubbed her “the basket lady”! 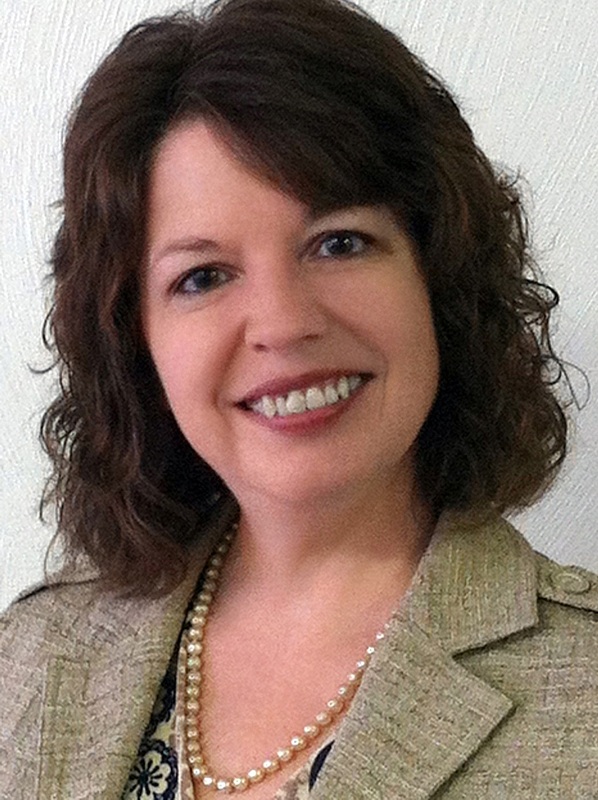 Connie also believes in providing a consistently “superior quality product” at a reasonable price. 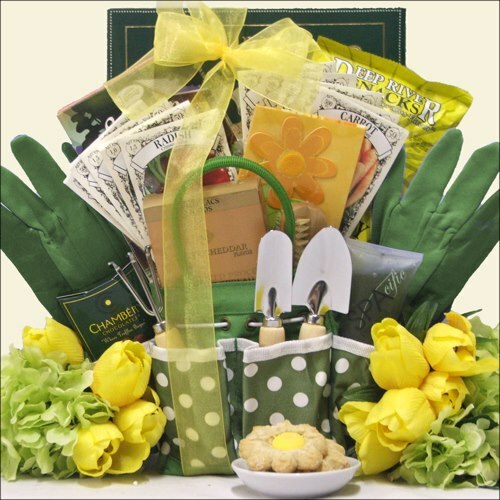 Exquisite Gift Baskets strives for personalized service and a “better than expected” customer service experience. 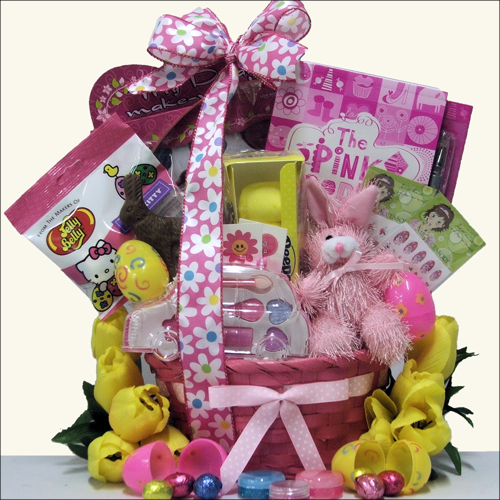 Exquisite Gift Baskets offers a wide variety of customizable baskets. From Gourmet gift baskets full of hand-selected treats, to holiday and themed baskets - she truly has it all! Connie also specializes in corporate and “one of a kind” baskets. Each basket is only created after your order is placed. They are not mass-produced. In this way you are always assured of getting the freshest, hand-selected products. This attention to details really sets Exquisite Gift Baskets apart! I invite you to check out Connie’s website, www.exquisitebaskets.com and Facebook page, www.facebook.com/exquisitebaskets for more information and some wonderful pictures of her baskets! 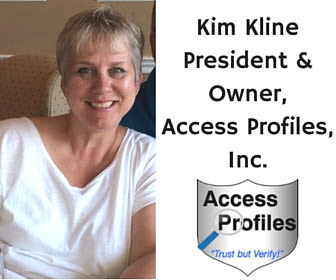 For more on this continuing “Spotlight on Small Business” series, check out Access Profiles - “Week in Review” and www.accessprofiles.com for Small Business and Background Check information! 4 Tips on Using Your Business and Social Media to “Pay it Forward”! Although written long ago, these words still hold true. 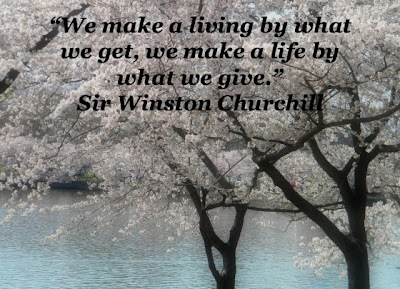 For me, the greatest way to realize success yourself is to help others achieve theirs. I put this question to myself and found a path that works for me. I decided to focus my efforts on helping other small business owners. My thoughts are to promote their businesses and hopefully start a “pay it forward” cycle of success! I started my path in small ways. I actively “liked”, commented, and shared the posts and blogs of others through Facebook, LinkedIn, and Pinterest. In this way I was able to help others find the engagement and audience they needed to get the word out about what they do. I continue to try and do this daily. This is a very easy step, but can really make a difference. I have begun to feature other blog writers in my online paper. I searched for articles within my social network connections and made sure to feature them in my latest edition. To get more traffic to their blog, I would also share the paper through all my social media channels. I then make sure to let the authors know they have been featured. Another venture of mine was to start a blog series called “Small Business Spotlight”. 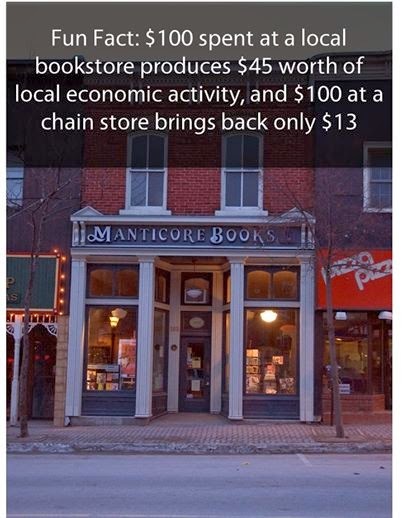 Periodically I have highlighted one small business in my paper. Through my article I help promote this business by letting others know a little more about who they are and what they do. Each of these steps is designed to help where I can. Selfishly, I have found I love it! This doesn’t mean I don’t focus on the success of my own business, but I find that wanting to “pay it forward” to others and my own goals need not be mutually exclusive. 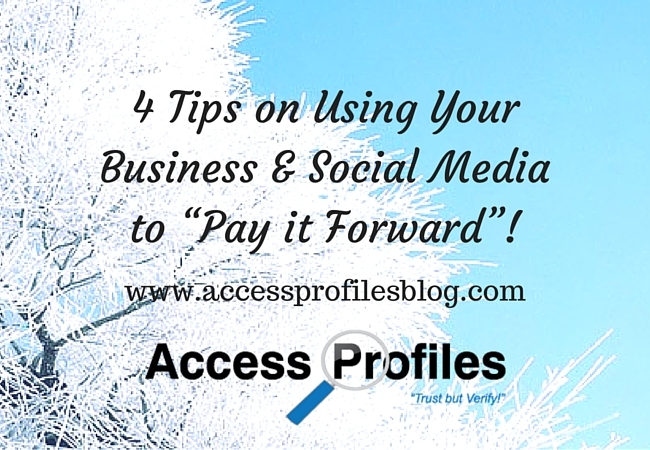 Help Pay it Forward and Share! Leave a comment too ~ I would love to hear from You! I invite you to discover more About Me and My Services! Let's Connect! Contact Me for links to my social sites! Thanks. New Small Business Spotlight! - Now Featuring RemSource, Inc. This is the first blog article in what I plan to be a series featuring Small Businesses! This week I would like to focus on RemSource, Inc.
RemSource provides Outsourced Administrative Services to Small Businesses. Their service specialties include Communications (phone/email), Scheduling, Customer Service, Business Process (internal systems), and Bookkeeping. RemSource was founded in 2009 by Azi Rosenblum. Mr. Rosenblum took his knack for operations and started RemSource to fulfill what he saw as a major need by many small businesses, help with administrative tasks. Their ideal client is the small business owner who is feeling overwhelmed by the many “hats” they have to wear but is not ready to make a full-time hire. This is where RemSource steps in. RemSource’s mission is to enable companies to free up valuable time and resources from handling administrative tasks and focus them on what really matters - business growth and development. Using RemSource also helps the business owner regain some “downtime” that can be used for family and personal life! RemSource employees work from the RemSource offices and not at their client’s company. This eliminates the need for their clients to have space or equipment to accommodate the person handling these administrative tasks. 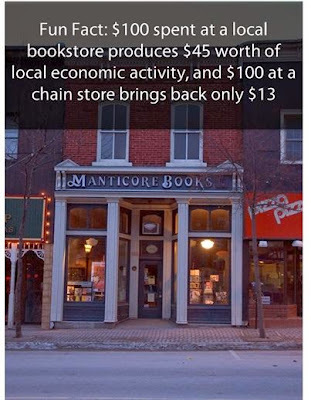 Because of this, it doesn’t matter whether your small business has a brick and mortar location or not. According to RemSource, their goal is NOT to operate like an answering service. They work at becoming integrated into your company so that when your customers contact you, they feel like they are talking to a secretary or administrative assistant. RemSource strives to learn about your business and get to know the names of your company employees and your processes. This helps them deliver professional service. RemSource provides services in monthly packages*. They initially offer a discounted trial month. During this trial period, RemSource gets to know your business and the nature of your work. When that trial month is complete, they will quote a monthly rate and continue to provide high-quality results. *RemSource does offer hourly project work. If you would like to learn more about RemSource, Inc. or have any additional questions about what they can offer, please visit their website at www.RemSource.com and follow them on Facebook at www.facebook.com/RemSource! Access Profiles - "Week in Review" ! “Your ambition should be to get as much life out of living as you possibly can, as much enjoyment, as much interest, as much experience, as much understanding. The 1960s was a time when many women were fighting for equality. We wanted the chance to succeed in every way open to men. I applaud those strong women who worked hard at putting cracks in that barrier. I was very lucky that I grew up being told I could accomplish anything I chose to do. There was never anything that was closed to me. For this I am thankful. While things are infinitely better than they were then, the issue of equality still rears its ugly head. I read stories every day concerning disparate pay for equal work or statistics on the lack of women in top executive positions. Some of this can be attributed to discrimination. However, I would also like to propose another possible reason. Women are choosing a different path. Maybe the need to “have it all” that has been re-evaluated. While we still want opportunities open to us, it is what we choose to do with those opportunities that has changed. Rodham Clinton’s “balance” lists family first and includes service. 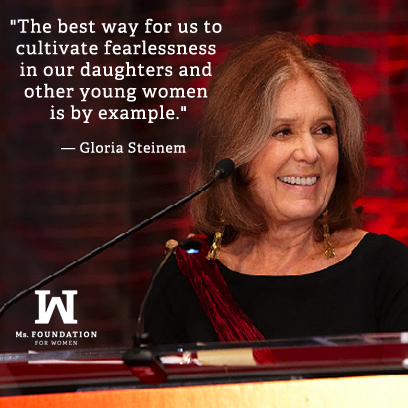 Like many of us, she appreciates and values more than what can be provided through her work. Many of us are placing our focus on this different value set. A real balance between work and “life” is our goal. Money and status is not the driving force. We want to create a life of value. Creating a Life of Value is the Ultimate Success! "Tweet This"
That value, of course, is subjective. But the desire to work at something that “matters” resonates with many. It may no longer be the big money or boardroom position that drives us. What we, as women, have now earned is a choice. Each of us can decide our own goals and have the freedom to pursue them. We also need to recognize that one woman’s choice may not be our own. The celebration should be in the choice itself. 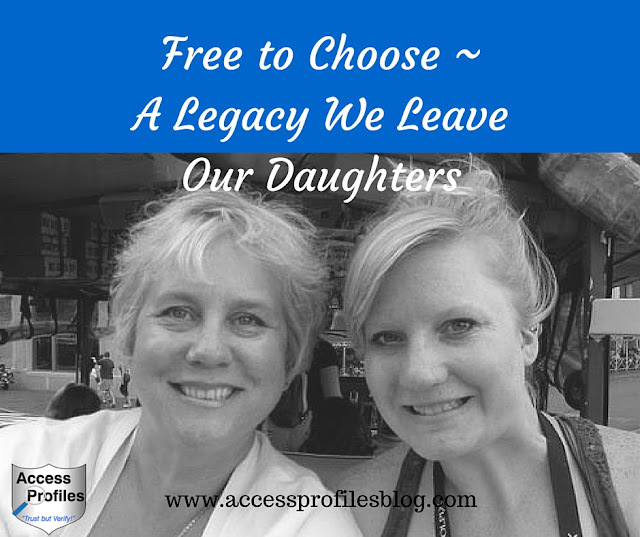 It is this ability to choose that we leave to our own daughters. I know I want my own daughter to find fulfillment in whatever way is important to her. Whether it lies in the traditional “corporate track” or not is up to her. And I wish the same thing for our sons. My only hope is that finding a life of purpose and value is part of the equation! to receive one new article each with with Small Business Tips & News.